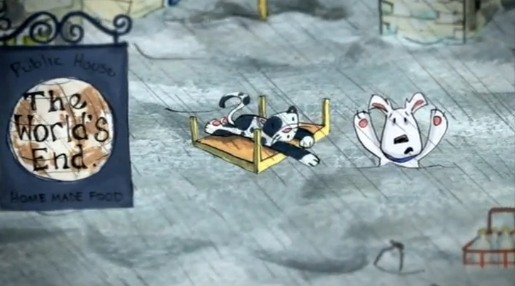 The UK Government has raised the temperature with “Bedtime Story”, their climate change TV advert featuring a drowning puppy and rabbits dying of thirst. The Advertising Standards Authority in the UK is responding to 375 complaints about the impact of the commercial on young children and may recommend that the ad be shown after 9 pm only. The Department of Energy and Climate Change (DECC) launched the commercial as part of its Act on CO2 campaign. A web site, “Change How The Story Ends”, provides opportunity for follow up. Complaints about the commercial suggested that the material was not only distressing for children but also had entered into a the realm of scaremongering, inaccurate science and political propaganda. Others have also complained that the advert which is part of a £6million campaign had presented human caused climate change as fact and challenged the statistics used. The Department of Energy and Climate Change (DECC) launched the commercial as part of its Act on CO2 campaign. The government department’s campaign is a response to research by YouGov that suggests that more than half of the UK public think climate change will have no impact on them. Only 1 in 5 (18%) of the 1039 respondents thought that climate change will take effect during their children’s lifetime. 74% of people said they would take immediate action to change their lifestyle now if they knew that climate change would affect their children’s lives. The Bedtime Story ad and the Act on CO2 campaign were developed at AMV BBDO, London.